This is a list to help you decide what software to use for creating pixel art. It currently contains all the most popular desktop applications. If something is wrong or missing, let us know in the lospec subreddit. A basic web-based editor made to be simple and intuitive. Can use any palette from our Palette List. A popular actively developed editor. 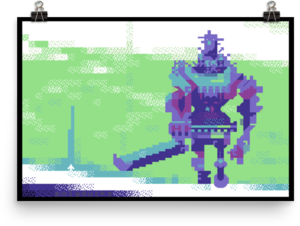 Has a pixel art interface. A smaller pixel art program most focused on tile editing. A japanese pixel art tool created in 2005 but still being updated. Recently made freeware. Excels at animation with features such as onion skinning. A big multi-purpose image editing app, which if tweaked to the right settings can easily be used for pixel art. Some features like animation can be tricky to use, but the flexibility of the program allows you to mimic advanced tools such as index painting and palette manipulation. Professional tool inspired by Amiga Deluxe Paint (DPaint). Has a detached window interface. A free image editing program for windows, originally intended as a replacement for MSPaint. A simple painting program included on Windows XP. Later versions of the program do not support pixel art. Originally created for DOS and has since been ported to Windows. Inspired by Amiga programs Deluxe Paint and Brilliance. Has some tools no other program does, but has an antiquated interface. A multi-purpose image editor, designed to be a free replacement for photoshop. Can be configured to use for pixel art. Uses a floating window interface. A free, open source program that's been in development since 1999. It is intended for digital painting but can be set up for pixel art. An online open source pixel art editor with a user gallery. An open source pixel art editor.